Walking down the streets of Berlin, the signs of early summer are everywhere. The flower stalls are selling five different kinds of peonies, the asparagus season is beginning to wane and, my most favourite of all, little strawberry-shaped kiosks have popped up all over the city offering delicious, juicy fruits which have never seen the inside of a refrigerator. For those of us in academia, early summer means more than just the long-awaited strawberry season: the end of the academic year and a summer away from the bricks and mortar of our institutions in a far away archive. Long sunny days filled with reading and more reading… Before we all scatter for the summer, I wanted to write a post to celebrate and highlight the work of some of our contributors. For the past two years, a wonderful group of graduate students have been sharing their ideas with us on the blog bringing us cutting-edge research and fresh ideas. Just in case you missed their posts, this is a handy round-up! 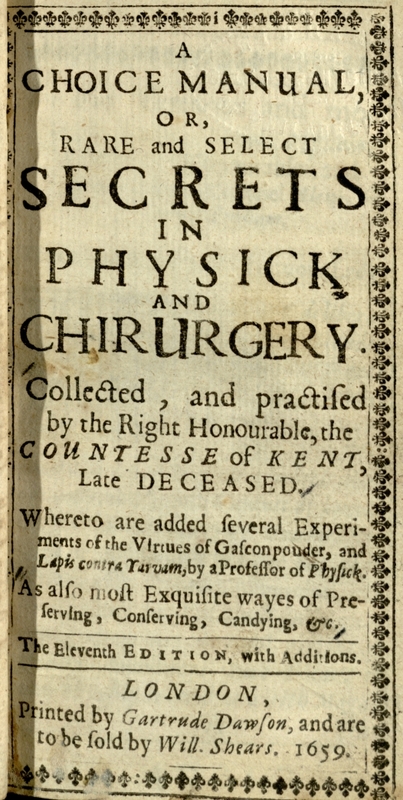 Katherine Allen (Oxford, History of Medicine), has been telling us about a diverse range of topics over the past two years from tobacco smoke enemas to how eighteenth-century English men and women fought off coughs and colds to distillation and alchemy. When not blogging, she is completing her thesis titled ‘Recipe Books and the Exchange of Medical Knowledge in Eighteenth-Century English Households’ (projected submission date: summer 2015). 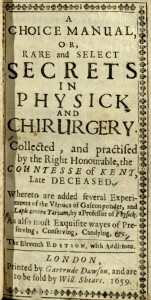 Her work deals with the material and social history of manuscript collections of medical recipes in eighteenth-century England, and their role in domestic medicine. 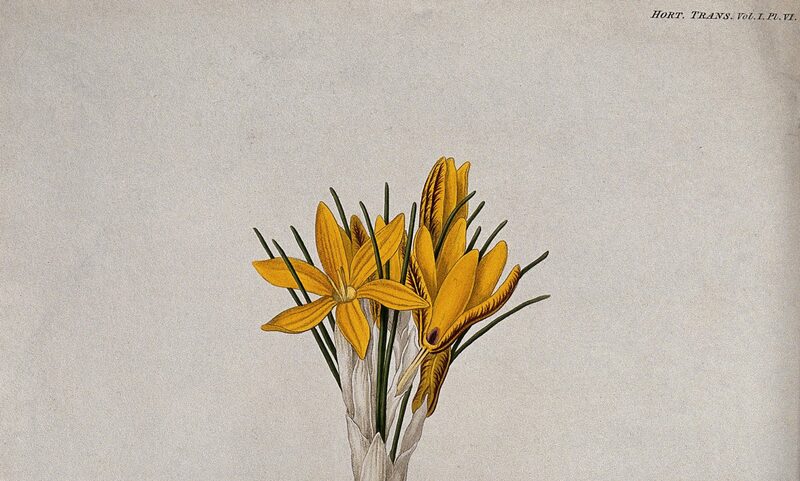 Colleen E. Kennedy (Ohio State University, English Literature) has enticed us with her posts about sweet (and not so sweet) smells, perfumes and poetry. Her dissertation ‘Comparisons Are Odorous: The Early Modern English Olfactory and Literary Imagination’ enhances the vibrant critical conversation about early modern embodiment, affect theory, and sensory history by following different whiffs of the highly subjective past. By exploring the complexities of aromatic discourse in early modern literature, she recovers a lexicon of olfactory imagery and stereotypes, challenge modern assumptions about early modern stench and hygienic practices, and suggest new ways of gaining access to the early modern cultural imagination. You can also follow Colleen’s work at: http://colleenekennedy.wordpress.com/. Tillmann Taape (Cambridge, HPS and MPIWG, History of Science) is a first-year PhD student writing a thesis titled ‘Hieronymus Brunschwig and the making of vernacular medicine in early modern Europe’. His research investigates the intersection of learned and artisanal knowledge in Brunschwig’s writings on surgery and distillation. In the last year, Tillmann has told us stories about an alchemical disaster (complete with an exploding still and knocked-out practitioner), ‘coded’ plague remedies and ‘distilling the essence of heaven’. 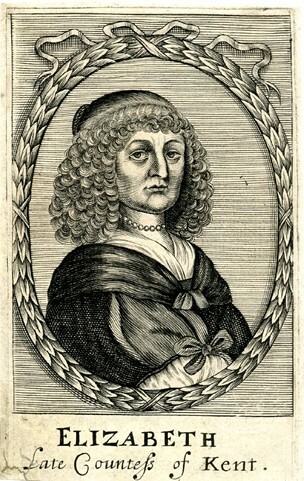 Ashley Buchanan (University of South Florida, History) has introduced us to the world of the last Medici Princess, Anna Maria Luisa de’ Medici (1667-1743). Her posts on Anna Maria Luisa’s recipe collection has transported us to back to eighteenth-century Florence with virtual tours around the Medici Granducal Fonderia and an introduction to a miraculous powder purported to treat infant convulsions. In the next couple of years, Ashley will spend much of her time in the Archivio di Stato in Florence. Her dissertation aims to explore Anna Maria Luisa’s role in the in the collection and production of early eighteenth-century medicinal therapeutics and alchemical knowledge. 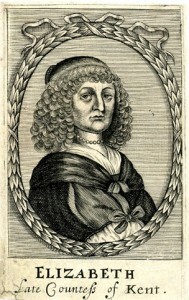 In particular, Ashley is interested in tracing the networks through which Anna Maria Luisa procured and disseminated her exotic raw materials and “secret” remedies, as well as, to understand the desire for elite women to participate in such activities and the social capital they created for themselves in the process. Rachel Snell’s (University of Maine, History) dissertation is provisionally titled: ‘“Mistress, Mother, Nurse and Maid”: Domesticity and Women’s Work in the Anglo-American World, 1828-1876’ (project completion date 2015/16). Her project is driven by the question – how did the ideaology of domesticity function in ordinary women’s lives? It focuses on printed and manuscript cookbooks through a comparative Atlantic history perspective on the cultural construction and the lived experience of domesticity in Great Britain, the United States, and Canada. Over the last few months, Rachel has shared her experiences working with historical GIS and in her quantitative analysis of annotations in Maria Rundell’s A New System of Domestic Cookery. With the working title ‘Food Fit for a King? Dining Culture at the Rising Court of Brandenburg-Prussia under the ‘Great Elector’ Friedrich Wilhelm: 1640-1688’, Molly Taylor-Poleskey’s (Stanford, History) dissertation (planned completion date summer 2015) follows the rise of the House of Brandenburg-Prussia during the reign of Elector Friedrich Wilhelm through the cultural lens of food and dining at court. This angle allows her to zoom in to the minute rituals of everyday dining at court (which reified the court’s internal social structure) and also to look at matters of import on the wider European political stage (such as the acquisition of resources from territorial gains). The topic of food offers her the opportunity to connect political cultural history with medical, environmental and commercial history to understand the motivations of the people involved in the court’s rise. Since joining the project, Molly has shared with us the fascinating histories of our favourite Christmas treat the lebkuchen and the best (?) breakfast in the world – beer soup. Sally Osborn (University of Roehampton, History) is currently in the final stages of completing her thesis ‘The role of domestic knowledge in an era of professionalisation: Eighteenth-century manuscript medical recipe collections’ (planned completion date 2015). Her project concentrates on exploring medical recipe books as a form of domestic record-keeping. 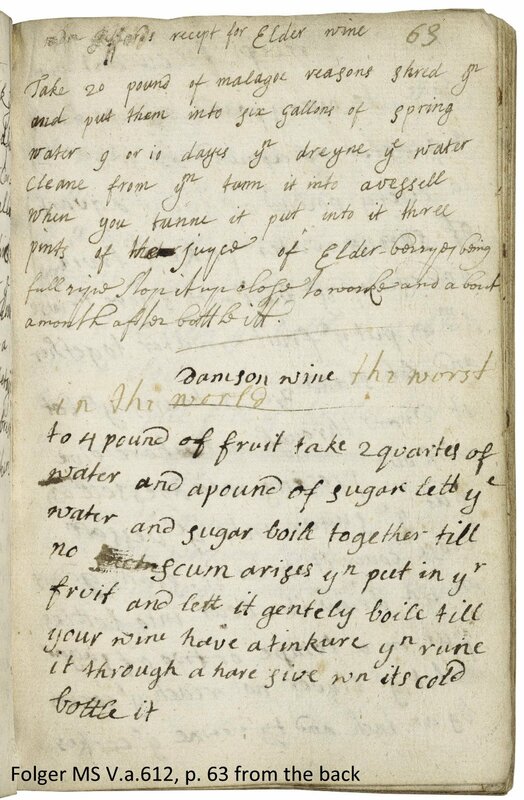 In the last two years, Sally has regularly shared her ideas with readers on The Recipes Project including posts prompting us to ponder on ‘what is a recipe?’, 18th century DIY and ingredient substitution. Sally blogs at http://18thcenturyrecipes.wordpress.com and can frequently be found on Twitter, @sallyosborn. USS Monitor crewmembers cooking on deck, in the James River, Virginia, 9 July 1862. Photographed by James F. Gibson, courtesy of Wikipedia. Food rations during wartime do not have the reputation for being delicious, fresh, or even edible, and this was especially true during the American Civil War. 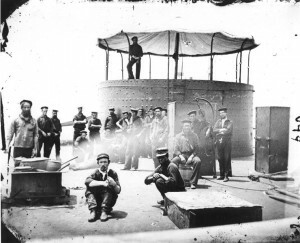 Fought from 1861-1865, the war disrupted supply lines across the United States, making food difficult to acquire for soldiers and citizens alike. When Union (northern) and Confederate (southern) troops were receiving rations, these usually included hardtack, salt pork, flour, and cornmeal; when soldiers were lucky, this rather grim diet was supplemented by small amounts of condiments such as molasses, salt and pepper, and sugar; beverages such as milk, coffee, or tea; and vegetables such as rice or hominy, dried beans or peas, and “fresh” (although frequently desiccated) vegetables. And whenever they were able, soldiers and sailors foraged for food, or traded with locals – both free and enslaved – in order to survive. Finding and issuing nutritious, reliable rations was made even more difficult by the new military equipment that was developed during the Civil War. Although European countries had begun developing ironclad ships in the late 1850s, American shipbuilders were not prompted to create this innovative type of ship until the American Civil War. The South was the first to construct their ironclad (the CSS Virginia), followed quickly by the North. The Union’s USS Monitor, designed by John Ericsson, was ironclad as well as semi-submersible: it was the first ship with its living quarters and engines entirely below the waterline. The ship was nicknamed “Ericsson’s Folly” and “cheesebox on a raft” as no one thought it could float, let alone sail into battle. Because the sailors lived almost entirely underwater, provisioning them and keeping them healthy proved to be a difficult undertaking. 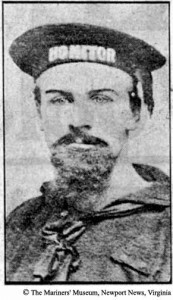 George S. Geer, First-Class Fireman, USS Monitor. 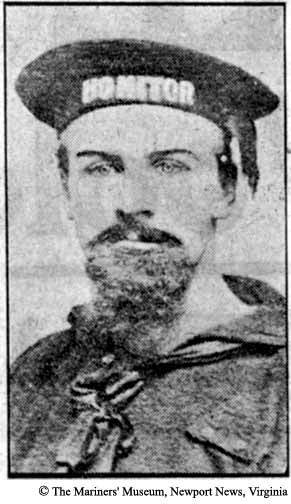 Image courtesy of the Mariner’s Museum, Newport News, Virginia. “Duff,” in The Oxford Companion to Food, Alan Davidson, ed. (New York: Oxford University Press, 1999), 259. “Letter No 2,” George S. Geer Family Papers, 1862-1995, MS010, The Mariners’ Museum Library, Christopher Newport University, Newport News, Virginia. A.A. Hoehling, Thunder at Hampton Roads (New York: Prentice Hall, 1976). The Folger Shakespeare Library in Washington, DC has one of the most significant collections of English Renaissance books and manuscripts in the world. Today I am talking with Dr. Heather Wolfe, Curator of Manuscripts. As Curator of Manuscripts at the Folger, you oversee approximately 60,000 manuscripts, with the wide range of sources. What are some of your institutional priorities for the manuscript collection at this time? Our institutional priorities are two-fold: grow the collection, and continue to make it more accessible. To that end, our goal is to acquire manuscripts that provide a window into society in early modern England, and beyond that, any manuscript, typescript, or other unpublished item that relates to Shakespeare up to the present day. Before we purchase a manuscript, we always ask ourselves: What is its current or future research value? How does it relate to other manuscripts, books, and visual materials in the collection? Our collection development policy for manuscripts provides further detail. Accessibility involves every division at the Folger. Conservators regularly stabilize, mend, and conserve manuscripts so that readers can access them and the public can see them in exhibitions. Our Photography and Digital Imaging department adds new images of manuscripts to our digital image database on a weekly basis. Our Acquisitions department makes new acquisitions available as quickly as humanly possible. Our rare materials cataloger, Nadia Seiler, does a great job of describing manuscripts in Hamnet (our catalog) and in our finding aids database. Beyond that, we highlight manuscripts on a regular basis in our research blog, The Collation, and through other social media. Directors of Folger Institute seminars are always encouraged to use manuscripts in their classes, and in general, we talk about them whenever we are given the opportunity! Congratulations on your IMLS grant for Early Modern Manuscripts Online (EMMO)! Can you give us a project overview and an update on where you’re at now? Thank you — we were so excited and honored to receive the grant! EMMO is a project to transcribe all of our early modern English manuscripts and make them available in a searchable database alongside digital images and catalog records for each item. They will be keyword searchable, but also searchable by many other categories. A brief overview of EMMO can be found on the Folger’s research blog, The Collation. 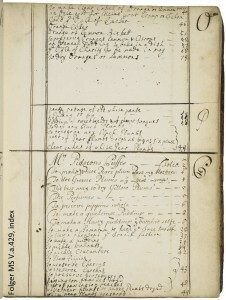 Of course, EMMO will include transcriptions of all of our receipt books, which we hope will really push research forward in a variety of ways. We are still in the very early stages of the grant — hiring a project manager, two project paleographers, assessing the needs of our users, and talking to potential partners about software development. Last month, I interviewed Jen Wolfe of the University of Iowa’s DIY History about crowdsourcing manuscript transcriptions. By comparison, the Folger is taking a more hands-on approach to crowdsourcing. I suppose this is partly because secretary hand can be very difficult to read, but can you talk a bit more about your thoughts on the training and standards required for transcribing? I love DIY History, and I hope that our crowdsourcing platform is as successful! Our biggest challenge is figuring out a way to get the right manuscripts to the right transcribers. The majority of our early modern manuscripts are written in English secretary hand, which requires training in order to learn how to read accurately. 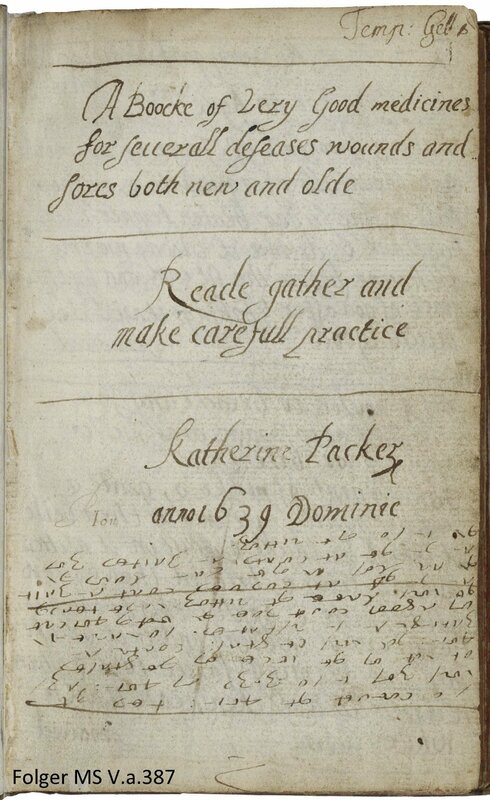 There are plenty of good online paleography tutorials out there; in particular, the ones at Cambridge, the National Archives (UK), Scottish Handwriting, and a new one connected to Oxford’s Bodleian Library. 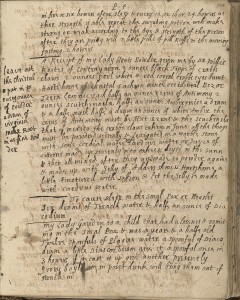 English paleography is also taught at a number of places, including the Folger, the Huntington Library, and University of Virginia’s Rare Book School. For EMMO, we are thinking about developing some sort of game with different levels–each time you get to a higher level, more manuscripts of increasing difficulty are made available to you to transcribe. Obviously, the number of “citizen humanists” we attract will be smaller than most crowdsourcing projects because of the special skills involved, but we believe that if people are interested, they can learn and contribute. And we’ll provide a simple set of guidelines for making semi-diplomatic transcriptions. We would LOVE if the readers of this blog would volunteer to share transcriptions with us (partial ones are okay) in whatever form they have, or incorporate transcription into their coursework, or become some of our crowdsourcing superheroes! We will let people know via our research blog and social media when we are ready for crowdsourcers, but feel free to contact me before then if you have transcriptions that are ready to go. 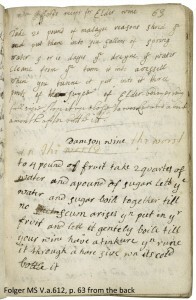 Could you tell us about the scope of the Folger’s collection of recipe books? Are you still collecting in this area? I just did an advanced search in our catalog, Hamnet, for the form/genre term “Cookbooks” and material type “Manuscript” and got 74 hits. I did another search with the form/genre term “Medical Formularies” and material type “Manuscript” and got 114 hits. Obviously, many of our recipe books have both genre terms attached to their records, but that gives you a rough estimate: over one hundred medical and culinary recipe books, ranging in date from ca. 1550 to ca. 1800. We acquire a few recipe books every year — they are a big strength of our collection and one that is important for us to grow. They provide such a wide variety of research opportunities. 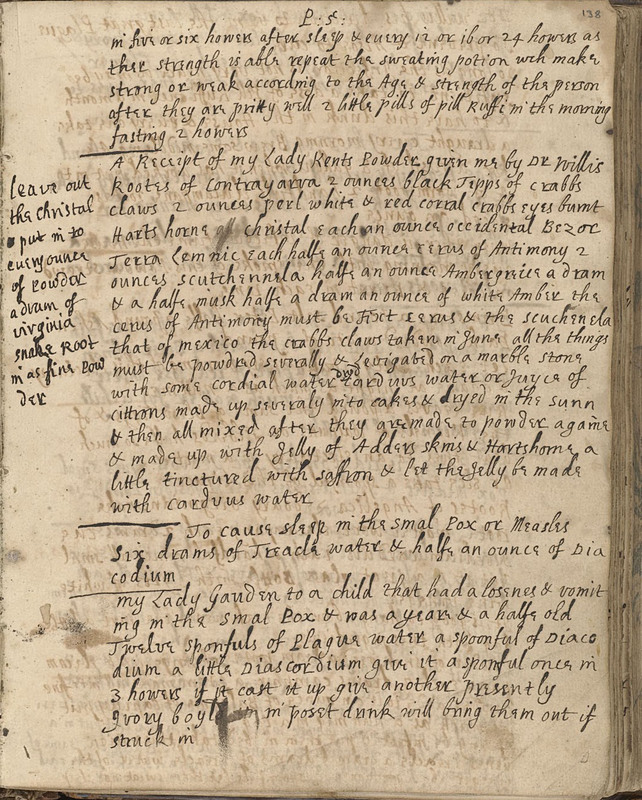 Several years ago, Adam Matthews produced a fantastic microfilm collection of Folger manuscript recipe books, for which blog editor Elaine Leong wrote the introduction. Now that online digitization is more common than microfilm, are you considering updating this? The microfilm collection is a great way for people to access our recipe books, and I often point people to Elaine’s helpful introduction to it online. It includes 89 recipe books, but we have acquired many others since then so it is no longer complete. Our long-term strategy for EMMO is to digitize and transcribe the entire early modern portion of the manuscript collection, so at some point, users will be able to see and read everything in one place. 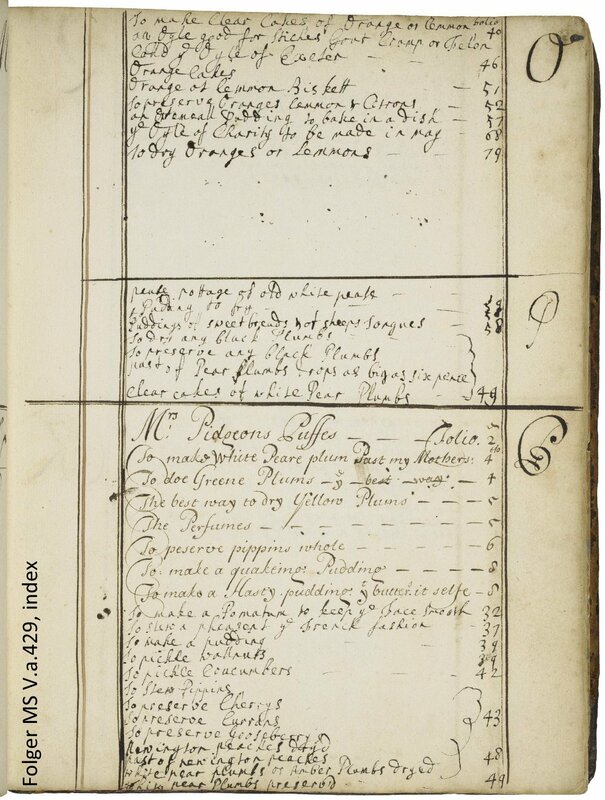 Here’s a link to the recipe book images currently in our digital image database. How do recipe books feature in some of your public programming events? 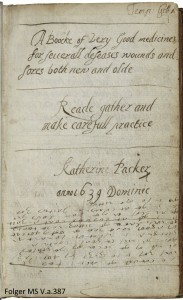 Rebecca Laroche curated a great exhibition at the Folger in 2011 called “Beyond Home Remedy: Women, Medicine, and Science”, which included many of our recipe books. She teamed up with the Smithsonian to create a video on the science of the syrup of violets. Another recent exhibition, in 2009, also featured recipe books with recipes for sleep: “To Sleep, Perchance to Dream”. We welcome ideas for other ways to feature recipe books. The EMMO transcriptions will certainly provide many more opportunities to share their contents! Thanks so much for the interesting interview, Heather! If you’re interested in featuring a library on the First Monday Library Chat, please email Michelle DiMeo .